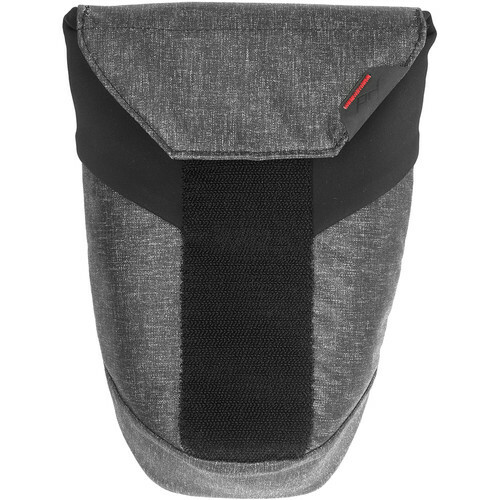 Store, protect and transport one telephoto, two smaller lenses, or a DJI Mavic Drone with the large, charcoal Range Pouch from Peak Design. The pouch features silent, touch-fastening closure, and an expandable top flap with a gusseted, stretch-mesh opening. Inside the pouch is a slip-in pocket for a memory card or other small accessory, and a flip-down, felt divider for stacking gear such as lenses or other items. There's also a clear-mesh window with quick-read labels to help you identify contents. Carry the pouch by hand or wear with the touch-fastening, rear belt loop. For strength and durability, the pouch is constructed from Hypalon-reinforced material and a weather-resistant 500D Kodra shell.